I was thinking about the movie “Phone Booth” during the new film, The Wall, by Doug Limon. The concept was the same, but the placement was clearly different. Whereas “Phone Booth” saw the main character trapped inside a phone booth on a busy city street by a crazed sniper looking to teach him a lesson, here we find ourselves in the deserts of Iraq. In 2007, the Iraq War had been deemed over, but for two American snipers, you could not tell. Isaac (Aaron Taylor Johnson) and Matthews (John Cena) were in Iraq investigating trouble for a work crew when they wind up pinned down and wounded by a mysterious sniper. When Isaac finds cover behind the remnants of a brick wall, he realizes that the sniper is talking to him over his own communication device. What follows is a tense character piece between Isaac and the sniper Juba (Laith Nakli) that brings the audience with them into the dirt and the grime of the Iraqi desert. The claustrophobic film really doubles down on the realism of the environment and the brutality of the situation, despite the outlandishness of the story. Blood, spit, snot, tears, sweat are everywhere and creates such mesmerizing imagery that develops the theme of helplessness for Isaac and the audience. Aaron Taylor-Johnson is tremendous as Isaac, filled with desperation and fear, yet never quite reaching the point of giving up. He bounced between all levels of human emotions, one minute feeling helpless to the next being filled with guilt over what he has done. He has to spend most of the time on screen alone, which makes the level of his performance even more impressive. There are some unbelievably devastating moments, including when he digs a bullet out of his own leg. I was honestly gritting my teeth right along with Isaac with each squirm-inducing second. John Cena turns in another very strong supporting performance. Cena has come a long way from “The Marine,” where he put on display his one-note emotion face. Coming off entertaining roles in Trainwreck, Sisters and Daddy’s Home, Cena brings it to this dramatic role with gusto and realism. The fact that Juba psychologically messes with Isaac over the coms really creates that sense of “Phone Booth.” He forces Isaac to think about what he has done and why he is still in Iraq, despite the “war being over.” Isaac responds to Juba in all kinds of ways, from cursing him out to almost engaging with him. It is like a cat-and-mouse game of a brutally realistic nature. 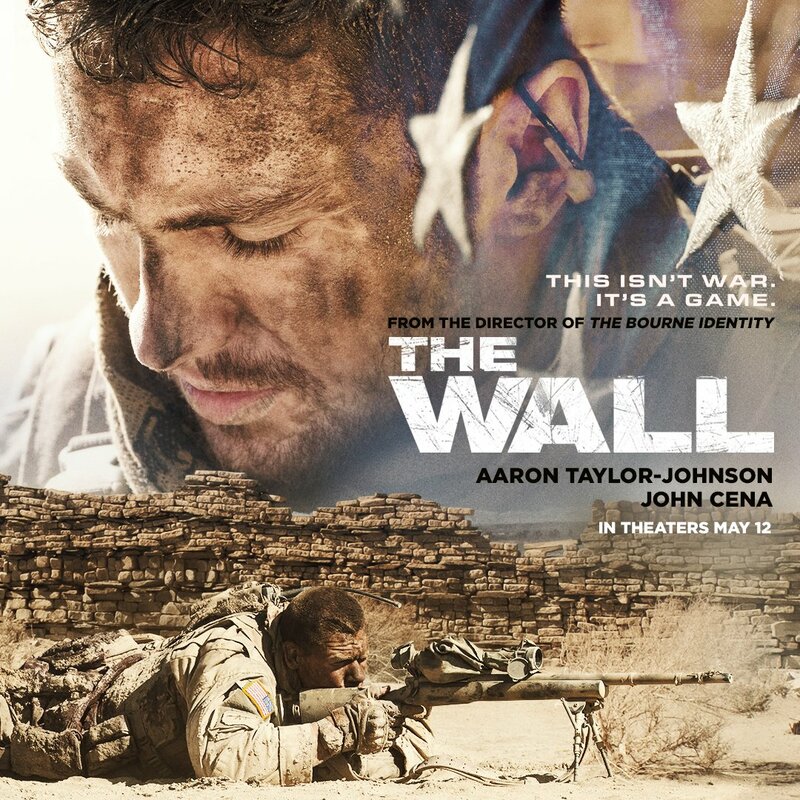 The Wall is a small movie, but it faces big issues. It feels more like a comment on how war can be isolating and, in the end, pointless. I am not sure how I feel about the ending of The Wall, but it does fit with the remainder of the film’s tone. I loved “Phone Booth” and The Wall is every bit as good as that film was.